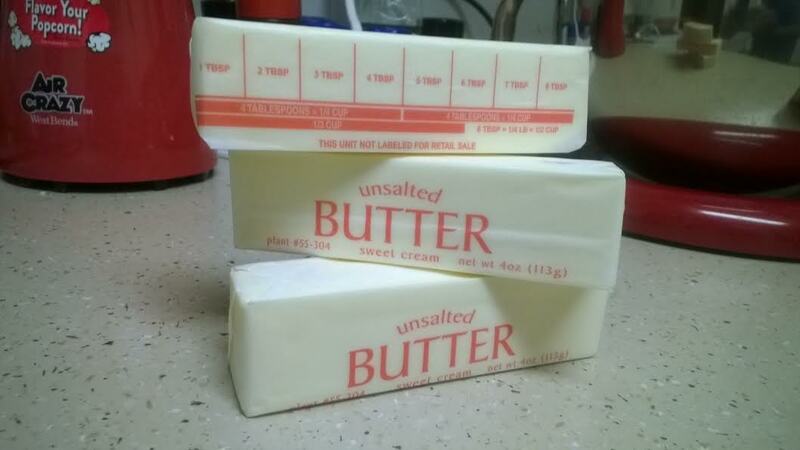 No, seriously, let’s talk about butter. I’ve been a Land O Lakes girl since the beginning of time, back when my grandma, Peewee, used to make her delicious, moist pound cake (not to mention her buttered potatoes, one of which she gave me every day after school. I’m still working those off, but man do I miss them). Because I grew up with Land O Lakes–and because everything Peewee ever made was utterly amazing–you can understand my hesitation about sampling new butters. What if my pie’s not as flaky or my biscuit’s not as buttery? Heaven forbid I give someone a treat and they notice something off about the taste. Well, nevertheless, I found myself in a situation the other day at Target. They had my prized Unsalted Land O Lake butter–at a moderately priced $4.74–but right beside it sat Target brand butter for $3.44. Now, I’m recently graduated and penny-pinching. A savings of even $1.30 means that I can buy an extra chocolate bar to melt for my homemade peanut butter cups. That’s tempting. I go to Target at least once a week for deli meat and I often do price comparisons between Target and (gulps) Walmart, but I don’t ever recall seeing the Target butter before. But here it was. And over there, 10 aisles deep, was that extra bar of chocolate. I bought the Target butter.